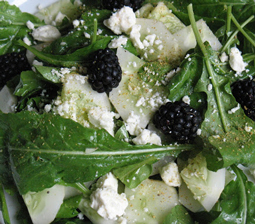 Blackberry & Cucumber Salad with Fennel Pollen - A recipe from Savor California, the online showcase for extraordinary gourmet foods and beverages from California. Recipe and photo courtesy of Cook In Dine Out. Whisk together the olive oil, vinegar, salt and pepper to make the vinaigrette. Combine the other ingredients in a large bowl and toss with the vinaigrette. After plating, sprinkle lightly with fennel pollen.